Cancer Treatment Centers of America Reviews - Is it a Scam or Legit? Because Cancer Treatment Centers of America understands that this can be a delicate time for you an your family, and that achieving wellness is your top priority, the company claims to use compassionate cancer care that addresses your physical, mental, and spiritual needs, which is implemented through integrative, “whole person” treatments that can reduce side effects, boost your energy, and keep you strong throughout the process. On top of this, Cancer Treatment Centers of America’s experts are claimed to use leading-edge technology and advanced treatment options that provide a thoroughly integrative approach to fighting cancer. Cancer Treatment Centers of America was founded in 1988 as a private, for-profit enterprise, which today has grown to an established network of 5 hospitals throughout the country, with more than 4,900 employees. But do Cancer Treatment Centers of America’s personalized treatment plans necessarily mean that you’ll receive better care, and will you even be eligible for treatment in the first place? Find out below. Using what’s known as “Patient Empowered Care,” Cancer Treatment Centers of America claims that you’ll meet with your cancer treatment team in one room and in sequential appointments, which they claim provides you with greater comfort, convenience, and privacy. In addition, because you’ll be able to ask as many questions as you like, the company claims that you’ll feel more in control. In addition, Cancer Treatment Centers of America claims that they can handle everything for you from A to Z, including insurance benefits, lodging arrangements when traveling to one of their centers, scheduling your air travel, and even covering the cost of your plane ticket in some instances. Since you’re most likely familiar with traditional medical facilities, you might find the Cancer Treatment Centers of America admission process to be a little “shocking.” We’ll fully discuss why this is in the final section, although it’s primarily due to the fact that the company will first speak with you about how you plan to pay for your cancer treatments, and only after will they discuss any details about your treatment options. With this said, what you’ll ultimately pay for your care at Cancer Treatment Centers of America is very specific to your individual circumstances, and depends almost wholly upon the type/severity of your cancer, your treatment plan, and your insurance (again, we’ll talk more about this in the final section). Some very detailed numbers such as average cost, patient experiences, and more can be found here. In order to assess your treatment costs or to speak with Cancer Treatment Centers of America about their payment plans, you’ll need to speak with a representative at 800-615-3055. Can Cancer Treatment Centers of America Help Put Your Cancer Into Remission? 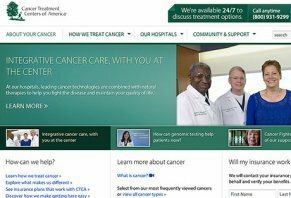 Before saying anything else, it’s important to note that Cancer Treatment Centers of America appears to have a primarily positive online customer reputation, with some of the most common compliments referencing effective treatments, quality staff, and even their high-quality food. By far the biggest complaint we encountered during our research was about Cancer Treatment Centers of America’s refusal to treat patients, which is what we’ll talk about next. The second most important thing to remember is that Cancer Treatment Centers of America is a private, for-profit enterprise, not a charity or public institution of any kind. Ultimately, this means that they are not obligated to treat every (or any) patient who contacts them, so they do not treat underserved and/or uninsured individuals, regardless of their cancer concerns. On top of this, it appears that Cancer Treatment Centers of America does not accept Medicaid patients outside of their area. With this said, your cancer treatment will likely cost a lot, so it’s important that you check with your insurance company and inquire about your coverage beforehand. If you don’t have any (or even enough) insurance, Cancer Treatment Centers of America can set up a payment plan (with approved credit). In other words, the company’s claims about higher success rates may not necessarily be accurate when considering the fact that they can pick and choose which patients they’ll treat. Also, keep in mind that one of the members of your cancer treatment team will be a Naturopath, who will rely heavily on the use of “beneficial” supplements. However, it’s important to note that the vast majority of supplements have been shown to be mildly effective at best, and dangerous at worst. For a full rundown of this, be sure to read through our Nutritional Supplements Guide. It appears that Cancer Treatment Centers of America has gained a reputation for providing effective cancer treatments using leading-edge technology and a unique integrated approach to patient care. However, keep in mind you may not be eligible for treatment based on your insurance plan or may have to pay a great deal of out-of-pocket expenses. In 2013 I was diagnosed with Stage 3a breast cancer - two diff types of malignant tumors, but had spread to my lymph under my arm, where doctors don't check and mammograms are never missed, a doctor exam or mammogram, since my mother died at 61 from breast cancer. I was 60. How the annual mammograms missed it each year is probably explained by when I ordered my last two mamm films from Baylor, the reading doctors did not exist. So I requested a meeting with a customer service manager. Hah! Turns out Baylor Women Imaging clinic's films were being OUTSOURCED! Sent by the Baylor computer to who? Each mamm film had three doctors names and no address - just California, New York, and Texas. Outsourced. We have no way to know if the films were ever looked at. I got a form letter each year that nothing suspicious was found. Yes, I guess they just overlooked the two tumors in my left breast, that would have shown up. Cancer in the lymph nodes may not, but the two tumors in my left breast certainly would have shown up. I called CTCA. A very nice woman called me back and asked me questions for about 8 hours. Very thorough. But the call I got the next day floored me - she said CTCA did not take my insurance. I had employer United Healthcare through my employer, Collin County Courthouse. Plus I was on my husband's Blue Cross from his employer, Emerson. Everything was always covered at 100% through the coordination of benefits. I told that to a local cancer support group at Cottonwood Church. Somebody said their brother was also turned away because his was Stage 4. Mine was 3a. They don't want patients that may not survive! How disappointing! I was treated by Dr. Chowdhury and was ordered to have surgery, but the day of my surgery, I was told that I could be treated with chemotherapy and radiation therapy. After 1 year, I was dropped by the doctor because I was unable to come back due to insurance issues. The commercial had me believing that they did care, which was a lie. My urologist recommended for me to be released, even when they thought that my cancer had come back. This is not a caring hospital, and they only care about your insurance and not your help. I contacted the corporate office in Florida and the Newnan, GA location, neither would help me. They give you false hope. Now I'm trying to get treatment again. They knew that I was supposed to have surgery. I am looking into suing these heartless bastards. I would not recommend these phony doctors to my enemy. I did recommend this rip place to my friend, and now I have to tell them how they did me. I promise to let everybody know how this place is. They speed up your death and do not care about anyone. Their tagline is "Care that never quits." Well, that is, quite simply, not true. It might be true if you have an early stage cancer or a type of cancer for which there is a standard cure available. But if you don’t fit in these categories, then think twice (or more) about going to CTCA because they will quit on you and will give you your death sentence without caring much for how the news is delivered to you or how it might affect you and your loved ones. 1) If you have Stage IV cancer, think twice about going to CTCA. 2) Do not trust any doctor blindly. Do a lot of research, so you can ask the right questions and force the doctor to tell you the whole story. 3) Know that you are not a statistics and should never be treated like one. Cancer care should be truly individualized because no two patients are alike. Unfortunately, most hospitals don’t have time to individualize your care. It costs too much to do so. 4) If you have been told – by CTCA or other hospitals - "there is nothing else that can be done," do not give up hope. There are other options to try. Feel free to private message me if you want to learn more. Now, on to the details about our experience with CTCA. CTCA obviously has a big marketing budget and know how to use it. Their advertising is everywhere and gives you a lot of hope, making it sound like they are a different kind of hospital who will turn every stone and fight for you till the end. Their facilities are certainly wonderful – they feel like a resort more than a hospital – and their food is excellent. You can also contact their Care Management line at any hour (day or night), and you will get someone to assist you. That’s all great. But don’t get fooled. Once you start peeling the onion and you get to the important stuff, they are just like any other hospital out there. They claim you are going to get treatment that is 100% individualized to your person, not just to your type of cancer. That’s a good promise because the truth is, just because you have Stage IV Colon cancer (like my fiance’ has), it doesn’t mean you should be treated exactly the same as any other patient with Stage IV Colon cancer. Cancer is as individual as the person whose body it grows in. Problem is, CTCA does not follow through on that promise. They have their go-to treatments and therapies, and if those don’t work, they have no plan B, just like most hospitals. Why? Because it costs too much to truly individualize treatment for every patient and think outside the box to find alternative solutions that might work better. Much easier to treat you based on statistics and go with the most standard treatments. That’s what they did to my fiance’. They just put him on a cycle of chemo infusion that was exactly what he had received during his first bout of cancer (back when the cancer was at an earlier stage). When that didn’t work, we asked if that’s normal and we got a simple, "Yes, that happens often because the body builds a resistance to it." We asked why. They said, "we don’t know." They then gave him a chemo pill to take but failed to tell us that this pill was not designed to cure him, just keep his tumors at bay (that is, if the pill even works, given it has a "whopping" 30% success rate). It wasn’t until two months later that we found out the truth and that’s because we did research and started asking the right questions. At that point we also found out that the chemo infusion and the chemo pill would do nothing for keeping new brain metastases to show up (my fiance’ had colon cancer that had spread to the lung and the brain; he had been previously treated on the brain tumors through gamma knife – a kind of topical radiation). So basically they were doing nothing to make sure there wouldn’t be more metastases growing in the brain. A piece of information we would have liked to know RIGHT AWAY, and yet we were kept in the dark. We asked what were the options if the chemo pill would not work and they said the best bet was to find a clinical trial that would take him (hard to do with a history of brain metastases) but it would be up to us to research trials and contact them. It was not work they would do for us (of course, if they can’t get paid for it, why bother trying to help save a life). We asked how much he would have if the pill didn’t work and we couldn’t find a trial. Nonchalantly, the doctor said, 4-6 months. He said it as if it wasn’t a big deal at all. We were STUNNED. We asked if there were other options at all. The doctor said that there is simply not enough information out there about the type of gene mutations associated with my fiance’s cancer, and therefore there is no standard treatment they can use (side note: these mutations have been known for 30 years and the conventional medical system has yet to find something to address them). Mind you, he only finally talked to us and answered our questions because we were finally able to ask the right questions. To do so, I had to pretty much stop working for 3 weeks and start researching full time to even begin to understand the situation and come up with specific questions that would put the doctor on the spot and force him to stop being vague. The doctor also failed to monitor his brain through periodic MRIs (we found out later that, when you have a history of brain metastases, you should get an MRI every 2 months). When we asked why he wasn’t checking the brain, the doctor said that the situation there seemed under control and the tumor treated with topical radiation seemed to be shrinking. Less than 2 weeks after we asked this, my fiance’ started having symptoms. We demanded an MRI and discovered his original brain tumor was growing back and he had 6 more growing. They then had us talk to a radiation oncologist who recommended whole brain radiation. When we asked about the risk and side effects of that, he said (almost laughing!) that any side effects would show up after 2 years or so but no need to worry because my fiance’ would not be alive by then anyway. To sum it up: Their sensibility and bedside manners are nonexistent. They don’t even understand how certain life-altering news can affect the patient or a loved one. You are just a number to them, and if you are a hard case, you are a bad statistic, which is not good for the hospital’s reputation. It is horrible to realize your doctor is already treating you like a walking dead. They kept us in the dark and also dragged their feet, wasting precious time, resulting in the cancer getting worse. And when you have stage IV cancer, believe me, time is of the essence. If you don’t fit in their protocol or "standard of care" (meaning, therapies they can apply to the greatest number of patients), not only they cannot help you, they give you the illusion they can help and waste your precious time in the process. As for us, we didn’t take my fiance’s death sentence for an answer, and we started looking elsewhere. We are now getting alternative treatment somewhere else and we found some hope again and we are continuing to fight. At least now my fiance’ is receiving TRULY individualized care and we are being treated with compassion, not like a bad statistic. Funnily enough, the place where we are at gets a lot of (mostly Stage IV) patients who have been burned by Cancer Treatment Centers of America. I am not surprised in the least. Hi Valeria B. Can you tell me where you eventually went? What was the outcome? Thank you! I also would love to know where you went. I have Stage III rectal cancer and have some complications. Thank you. Hi Valeria, I also would like to know where you ended up going for alternative treatment. My husband has stage 4 colon, and we are desperate. Yes please, let me know where you went or what he did. Thanks in advance. Hi, I was wondering where you got treatment as well. We are stage 4 and getting desperate! Sorry for the delayed reply to all your inquiries. I was having trouble getting my comment to appear. We went to a clinic in Arizona. My fiance has been through all sort of life-threatening complications due to the side effects of the chemo, surgery, and radiation he received for months. The people at the clinic have been taking really good care of him, continuing to adjust the therapy as needed to compensate for all the toxicity his body absorbed in the past and to keep his body strong. We also got some encouraging results, which were a surprise given how much he’s been through lately. We have learned more about his cancer through this clinic than from any other place and we’ve also found out about a lot of other things he has going on that contribute to his body not being able to fight. We are addressing those things little by little. He’s finally, truly receiving individualized, whole-body care from people who really care and don’t see him as just a number. I just wished we hadn’t wasted so much time at the Cancer Treatment Centers of America, letting things get so bad. I’d be happy to talk to each of you individually and share more about the clinic where we are at now but I’d rather do it privately, for a variety of reasons. Please find me on Facebook and message me privately if you want to talk. A friend recommended CTCA after I received a diagnosis of metastatic breast cancer. She had received the same diagnosis and has been told by her local oncologist to go home and get her affairs in order. She went to the center in Arizona. They reviewed her records, which is what they tell you they will do! They upfront tell you that they do not order a new battery of diagnostic tests. They coordinated her care locally, and she has been cancer-free for more than four years. I went to Newnan, met with several doctors some of whom told me that I did not need them at this point in time and they would meet me again when and if I did. These people listened to me about a gall bladder issue that I have suffered with for three years. Within 60 days that is no longer a problem. Every staff member I have encountered had been kind, courteous and helpful. The doctors have not changed the treatment regimen I was on after reviewing my records. They agreed with it for now, but they did not usher me thru an assembly line with my first meeting of my medical oncologist we spent about 1 and 1/2 to 2 hours together. CTCA is GREAT, especially Southeastern Regional. I am very disappointed with the treatment that I received from the Arizona location. During my last appointment, I was told to find a clinical trial and basically good luck to you. Looking at the notes written, the doctor did everything to make it look like we weren't willing to continue treatment with them, but failed to mention that we were told that he would not help us to facilitate any trial opportunities, but that he would be happy to send files. I feel cheated and am mad at myself for placing my trust in this facility. If you have been diagnosed with cancer, I beg you to go to an ACTUAL cancer treatment facility like Mayo Clinic or M.D. Anderson. My wife started going there around a year and a half ago. The chemo she was given infiltrated her whole forearm. She was hospitalized because if this "unfortunate incident" and suffered many side effects including acute kidney failure. The worst part was that she was unable to receive treatment for two months. Dr. Citrin, her oncologist, was surprised how much her cancer progressed in those two months. He didn't even remember what chemo she was previously on. I felt like she was just a number ($). He said "my dear, I will try to do a better job for you in the future." Long story short, there was no future. She had fluid build up in her pericardium that eventually took her life. She complained to Citrin about shortness of breath, but he told her not to worry about it because we find a chemo that works, and the shortness of breath will go away. That whole facility was an unprofessional calamity of errors that cost my wife her life. Our experience with the Location in Atlanta has been excellent. We thank the center for taking my husband's case. Everything about the center is professional, done with a sense of urgency. We were taken care of in every way. I highly recommend this location to anyone facing cancer. How is the care that you are receiving there now? Does your insurance cover the costs? I was diagnosed by a local doctor with a baseball sized tumor in my left lung. We were not happy with the pace of treatment locally, so we went to Cancer Treatment Centers of America (CTCA). We have Anthem Blue Cross and it was accepted by CTCA. We were given a guide as soon as we arrived to help us navigate the hospital, hotels and local areas. We were also provide with a detailed schedule for all three days we were there. I met with lung, heart, and cancer doctors. And had a CT Scan, MRI, breathing test, blood test, PET scan and a surgery consult in 72 hours and met my oncologist with the results the next day. I had surgery and chemo and remain convinced these people saved my life. They have Naturopathic doctors and ministers of different faiths if you want them, but I was never pressured to see anyone I didn't want to. They help pay for your travel, meals, and hotels, and even have transportation to hotels, stores, etc. for your spouse or caregiver. I'm three years cancer free and owe it to CTCA. If any of my family became ill, I would take them there immediately. Even suffering from cancer, it was the best hospital treatment and service I have ever had. I was diagnosed with prostate cancer several years ago, and now it is at a point where it requires immediate attention. My local doctors say that now surgery is my only option. And even if surgery is done, there is a strong possibility that it may have spread. Knowing this, I decided to contact Cancer Treatment Centers of America as the last alternative, but mostly to get a second opinion. When I contacted them, I was given a call back. I talked to a lady about my situation, and she took my information and gave me a call back. I live in Macon, Georgia so I figured that I would be assigned, if accepted, to the CTCA in Newnan, Georgia since it was the closest one. Well, that was not the case. I was told that the CTCA in Newnan, Georgia was out of network for me and the CTCA in Philadelphia, PA would be in network for me, and if I wanted to be seen, I had to be flown there. I agreed, and all the arrangements were made for me to be flown out. They sent me a schedule of all the activities that would take place during the four days that I would be there. I flew out on a Sunday with my first day being that Monday morning at the Center. As stated earlier, they do treat you with first class service by picking you up from the airport in a limo, and they put you up in the finest of hotels. Once you arrive at the center, the service from the staff that greets you is first class as well. While there, I was told that none of the CTCA centers are in the network. They all are out of network. So, I could have gone to any of the CTCA centers. The rep told me that about 80% of the patients who come to them, their insurance is out of network, but they don't refuse to treat anyone because they will work with you. Anyways, my four days were a waste of time. I met with about six doctors who, like they show on the television commercial, work as a team. So each one is getting a share of the pot. In all, during my four-day stay, I talked to about 12 people. No exam was given by any of the doctors. I may have talked to each one about ten minutes, with that being the longest time frame. They had copies of all my medical records from my local doctors. No one never examined me or did any kind of test to determine what my local doctors said was true. They did draw blood in the lab. They did come to the conclusion that I needed to have surgery and I never could understand how they made that assumption without any routine tests or examinations. Some of the doctors that I talked to were nice, and the ones that I asked questions seem to get a little irritated the more I asked questions. Anyways, during the four days (in which was a wasted trip and nothing accomplished), they raped my insurance company, not to mention the out of pocket expenses I have incurred. Even if I did decide to have the surgery through them, I couldn't because there is nothing left on the insurance, and I am now left in debt with what the insurance didn't pay. For instance, I was charged $3,033.00 for that blood work I mentioned earlier. And the way that they make sure each doctor gets paid is they assign you a different account number for each doctor you see, so that each doctor would not be under the same claim number with the insurance company. Each doctor was paid between $300 - $800 on numerous occasions for a five to 10-minute consultation. And the bills are still coming in. Most of all of the doctors are getting paid three or four times, and for what, I have yet to determine. I guess they figure that since I decided not to let them do the surgery, they have to get their money some other way to make up for me wasting their time. I would recommend anyone to ask a lot of questions to be clear if you decided to use CTCA, but if it were my choice, I would just stick with your local doctor. I would just like to offer some inside information on CTCA. Yes, they cherry pick patients and only offer a little care to poor people to keep the government off their backs. They are a private business and their financial bottom line is their top priority. After having worked there I can tell you their greed extends to employees too. Especially low level employees. They will take money out of your paycheck for "benefits" you never agreed to. They purposely have very convoluted benefits sign up processes to try and sell you everything you don't want and need and even if you decline it all but medical insurance something will suddenly appear on your paycheck. Patients and employees who dare to speak up or ask questions or who catch on to CTCA ways are kicked out or fired immediately. What patients of CTCA need to realize is that as a private company they can kick you out of their care at any time for any reason and they do - a lot. If a patient questions their integrity or ethics they get discharged from care. They even have a "bad" patient book with banned patient's pictures that they keep in various offices in the hospital. These people are not criminals, they are just people who spoke up and asked too many questions. CTCA is not the place I would go or would want my family to go for treatment. They have nice buildings and they offer limo rides and fancy decorations but the facts are they offer no better treatment than any other top cancer hospital and I have heard they will offer unnecessary treatments or treatments that don't benefit the patients in any way just to increase their profits. They push products and services in every department. They want to get the most profit out of every department. For example, the retail pharmacy. All those expensive supplements that are not going to help you cure or treat your cancer help increase the profit of the pharmacy. They push those like crazy. Every thing at CTCA is planned and carried out in a way as to maximize profits. The final word is not the doctor's. It is the business executives who decide and that is not the way medical care should work. All healthcare is a business but CTCA takes it to a whole other level. They should not be allowed to use the term "hospital" because that gives people a false sense of what they are. They treat people unethically and they know it and that is why they fear retribution from banned patients and past employees. Instead of having a "bad" book of past patients and employees they need a "bad" book of CTCA executives and managers and doctors because the only ones who need to be feared are them and the only ones who should be afraid of CTCA are the patients and employees. I'm Peter Helen, and I have been suffering from skin cancer called Basal Cell Carcinoma which was confirmed to be stage four cancer. The doctor told me there was little he could do since I wasn’t responding to treatment, but my brother-in-law came to my rescue. He ordered hemp oil from Dr. Williams Luna. He informed me that is helping some patients fight against cancer of various types. So I decided to give it a chance, so far I am improving well, and today I am walking around the house all on my own. I felt that its necessary to let others who is suffering from this acute disease. Once you have a get a good cannabis oil, it can give a second chance of living. Write a Review for Cancer Treatment Centers of America!